Israeli troops have killed one Palestinian and injured several others at a refugee camp in the occupied West Bank. The Israeli army said its soldiers shot dead the 23-year-old, identified as Qassem al-Saadi, during a military operation in the Palestinian city of Jenin in the northern West Bank on Wednesday. Some of the injured are said to be in critical conditions. Palestinians, who were "hurling rocks," at the soldiers. One Palestinian was killed and at least six others were injured after Israeli forces raided Jenin refugee camp and entered the house of a Hamas leader and prisoner. 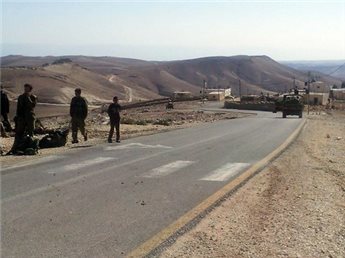 One person died on the way to hospital, an Israeli army spokeswoman told Ma'an. She said military medics were treating the injured Palestinians after the incident. The spokeswoman said Palestinians fired at army personnel who "retaliated in self-defense." Army spokesman Peter Lerner said that "operations like this are aimed at preventing the terrorists from reaching our towns and abducting our civilians and attacking Israeli commuters on the road." 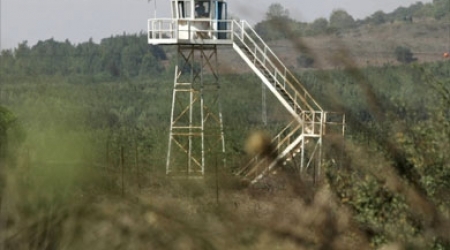 Israeli military watchtowers opened fire on Wednesday morning towards Palestinian farmers east of Beit Hanoun in the north of the Gaza Strip, local sources reported. According to ALRAY correspondent, no injuries were reported. Palestinian farmers are subjected to daily attacks by the Israeli occupation forces existed on the military bases on the northern and eastern borders of the Gaza Strip , in addition to the incursions which carried out on daily basis. Israeli forces vacated the Bethlehem village of Arab al-Rashayida on Tuesday after conducting military drills in the area for several hours, locals said. Fawaz al-Rashayida, head of the local village council, told Ma'an that 5,000 heavily armed Israeli soldiers arrived in the village at dawn on Tuesday. Locals are used to Israeli forces performing drills on the outskirts of Arab al-Rashayida, but this is the first time they have raided homes and local institutions in the village, Fawaz al-Rashayida said. The drills, which took place in between residential homes, caused damage to the village's water grid, he added. The population of Arab al-Rashayida is around 2,000 and the majority of residents live in cement houses, while others live in tents and dwellings made of steel and tin. On Monday afternoon, Israeli forces deployed in a nature reserve east of Arab al-Rashayida known locally as al-Muteirda, displacing nearby families and declaring it a "closed military zone." During military drills, Israeli forces can enter Palestinian homes and involve Palestinian civilians in their operations without warning them that the raids are mere practice. In November, Israeli human rights group Yesh Din said Israeli troops had been using a Muslim cemetery in Hebron as a location for military drills and practice. Approximately 18 percent of the West Bank has been designated as a closed military zone for training, or "firing zone," which is roughly the same amount of the West Bank under full Palestinian Authority control. Over 5,000 Palestinians reside in the firing zones in 38 communities. Israeli occupation forces stormed on Wednesday morning different neighborhoods in Nablus and arrested three youths after raiding their houses. locals said that the Israeli troops attacked Askar al-Qadim and al-Jadeed camps at 2:30 am and detained AbdullatifSharaya’h after assaulting him. They also raided Balata camp eastern the city of Nablus. 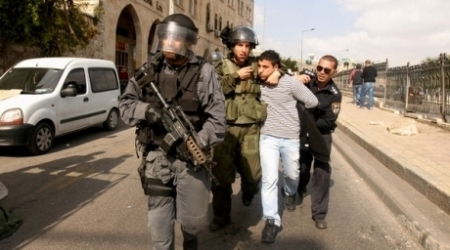 The Israeli soldiers attacked al-Najah university and arrested the student Anas Radad from Saida town in Tolkarm. 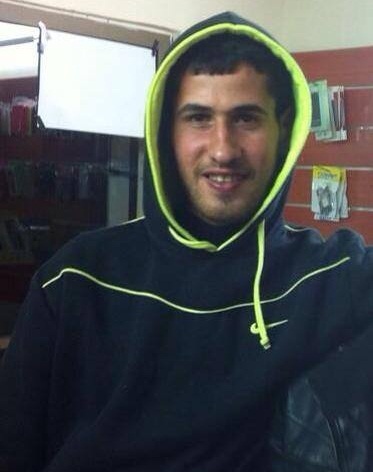 In al-Ein refugee camp, the Israeli occupation arrested ex-prisoner Mohammed Hamdan after searching his house. The detainees were taken to disclosed area, according to witnesses. In the same context, the Israeli troops erected a number of checkpoints at the entrances of BeitForik and BeitIba and imposed restrictions on the citizens’ movement at Innab checkpoint between Nablus and Tolkarm. 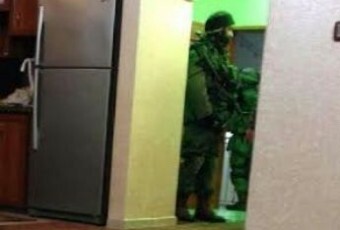 Several armored Israeli military jeeps invaded various neighborhoods in the northern West Bank city of Nablus, broke into and violently searched several homes, and kidnapped two Palestinians. Local sources have reported that the army invaded Al-Ein refugee camp, in the city, kidnapping one resident identified as Mohammad Hamdan. The soldiers also invaded the Askar refugee camp and kidnapped Baker Abdul-Latif Sharay’a, after violently searching his home and causing excessive property damage. Dozens of soldiers were seen surrounding the Kamal Jonblat School, Bleibla Street, Rafidia and the Askar refugee camp. Last Thursday, soldiers kidnapped Mohammad Daghlas, 19, from Nablus, after ordering him to head to the Huwwara military base for interrogation. Israeli occupation forces (IOF) raided the city of Tulkarem on Tuesday night and roamed various streets while firing teargas canisters at random. Local sources said that IOF soldiers in four armored vehicles provocatively patrolled the streets of the city and fired teargas and sound bombs at crowded area when citizens threw stones at them. They said that citizens suffered breathing problems especially inside shops while cameraman Ahmed Qaddoura was slightly injured in his head when shrapnel of a sound bomb hit him. Confrontations lasted for two hours until the soldiers withdrew from the city, which is the scene of repeated raids the latest of which was yesterday when undercover IOF soldiers kidnapped liberated prisoner Mutsem Iraqi, 25, who was released in the Wafa Al-Ahrar prisoners’ exchange deal. 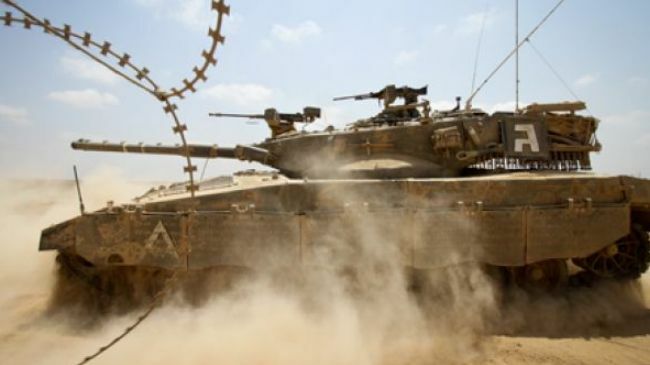 Israeli forces Tuesday conducted a military drill inside al-Rashaydeh village, located to the east of Bethlehem, according to the village’s head of council. Fawaz Rashaydeh told WAFA 30 military vehicles and hundreds of soldiers closed off the village while soldiers carried out military exercises in the village streets and between the homes, causing fear and panic. The army reestablished Monday a military base in the area that was evacuated in 2000 and ordered residents there to evacuate their homes, he said. 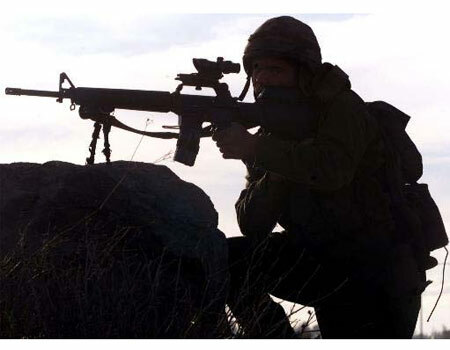 Israeli soldiers invaded the Rashayda village, east of the West Bank city of Bethlehem, and conducted military training in the village after surrounding it, Radio Bethlehem 2000 has reported. Local sources have reported that more than 30 military vehicles invaded the village after hundreds of soldiers surrounded it and started military training in its streets, causing panic and anxiety attacks amongst the residents, especially the children. On Monday, soldiers reinstalled a military base, which was removed in the year 2000, in Rajam An-Naqa area near the village, and ordered the residents to leave their nearby homes. In related news, Israeli soldiers prevented Palestinian bulldozers from removing the piled snow on a road leading to Khirbit Beit Iskarya village, isolated by the Gush Etzion settlement block, south of Bethlehem. Hasan Breijiyya, coordinator of the Popular Committee against the Wall and Settlements in Bethlehem District, has reported that the villagers have been facing very difficult conditions, imprisoned in their homes in the village, without essential supplies and aid. Breijiyya added that the residents voiced an appeal to human rights groups to quickly intervene amidst their deteriorating conditions. A young Palestinian was injured on Sunday, by gunfire coming from the Israeli watchtowers located around 500 meters from where he works in Beit Lahia, Northern Gaza Strip the International Solidarity Movement reports. His father summoned an ambulance and at the hospital it was found that the 17 year old suffered from a fracture in the shinbone caused by the bullet. The young man and his father believe that the fire came from control towers situated along the apartheid wall, inside of which there are automatic machine guns. His father does not have a stable job, leaving the young man and his four-year older brother to work to support a family of ten. On Sunday, the 15th of December, a young Palestinian was injured by Israeli gunfire in Beit Lahia, in the northern Gaza Strip. 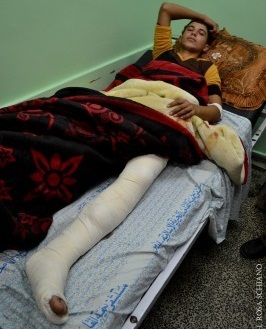 Mohammed el-Shanbary, age 17, was harvesting potatoes. He was working with the owner of the land and another person about 500 meters from the wall that separates the Gaza Strip from territory first occupied by Israel in 1948. El-Shanbary and his father, Rafiq, think that the bullets were fired from control towers situated along the separation barrier, inside of which there are automatic machine guns. A bullet wounded El-Shanbary in his left shinbone. After he fainted, the landowner called his father and asked him to summon an ambulance. 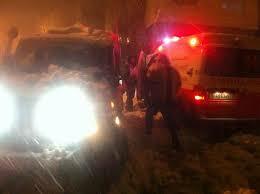 The ambulance took him to Kamal Odwan hospital. The bullet entered and exited, causing a fracture. El-Shanbary would have surgery 30 minutes after the visit. The doctor said that they would insert a tibial fixation. El-Shanbary started working in the area one month ago. This type of work ultimately depends upon the harvest season. His father does not have a stable job, leaving El-Shanbary and his 21-year-old brother to work to support a family of ten. He can earn from 25 to 40 shekels per day, depending on how many crates of potatoes he collects. For each crate, he receives two shekels. “Some time ago, they were shooting just to scare us, not directly at our bodies,” el-Shanbary said. “We work just to buy bread for our family, and they hit us,” his father added. However, Israeli military has attacked by land and sea from the very day after the ceasefire, with Israeli warplanes flying constantly over the Gaza Strip. Seven civilians have been killed by Israeli occupation forces since the end of their last major offensive, “Operation Pillar of Defense,” and more than 130 have been wounded. A Palestinian young man was wounded on Monday night when Israeli occupation forces (IOF) opened fire at a group of people east of Jabaliya, north of the Gaza Strip. Ashraf Al-Qudra, the health ministry spokesman, told the PIC reporter that a 19-year-old youth was injured with a bullet in his foot. He said that the young man was hospitalized in moderate condition. 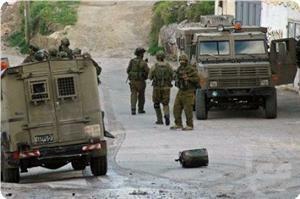 Violent clashes broke out on Monday night in the neighbourhoods of Bi’er Ayoub and Ein Al-Lozeh in the town of Silwan. 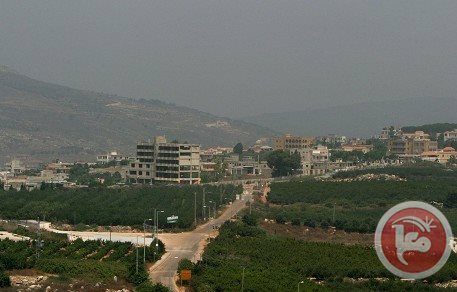 Wadi Hilweh Information Center was informed that Israeli forces randomly fired sound bombs and rubber bullets towards the houses of the locals and their properties in Ein Al-Lozeh resulting in material damages in several houses owned by Abbasi family. The forces also fired sound bombs and rubber bullets in Bi’er Ayoub, assaulted the passers-by and beat them with batons which led to the injury of one young man with bruises in his leg; the young men responded by throwing stones and Molotov cocktails towards police cars. 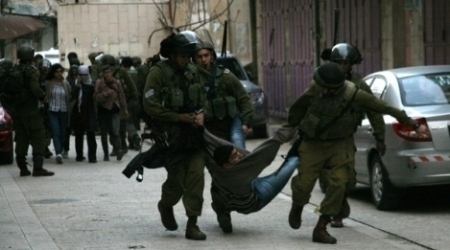 Israeli occupation forces arrested on Sunday evening a Palestinian citizen from Ya’bod town in Jenin district. Local sources reported that the Israeli troops detained Nidal Obadi,25, at Za’tara checkpoint in the southern Nablus while returning from university in Abu Dis. Witnesses said that the Israeli soldiers assaulted and beat Iyyad Husneya while returning to his house in Hebron. He was taken to Beit Jala Hospital. According to medical sources, Iyyad sustained moderate injuries and bruises in all his body. Israeli occupation jeeps ran over Hassan Obayyat,25, at the entrance of al-Aroub refugee camp. He was moved to the main hospital in Hebron suffering serious injuries. Israeli occupation forces (IOF) opened on Sunday Wadi Sofa dam east of Rafah, south of the Gaza Strip, flooding dozens of Palestinian homes, local sources said. The IOF opened its dams towards Palestinian houses without any prior warning for the second time since the stormy weather hit the region recently. Rescue teams have evacuated trapped people from their flooded houses and transferred them to safe places and shelter centers. Several Israeli earth dams have been established to the east of Gaza Strip, in order to benefit from rainwater and prevent its access to Gaza; however in such cases the Israeli occupation opens its dams toward the Strip to prevent swamping its agriculture lands. Many residential areas and agricultural lands in Gaza were flooded when the Israeli authorities opened up the dams, which aggravated the population's suffering. The Gaza Strip is currently under a state of emergency due to severe weather conditions caused by an unprecedented storm, where more than 1,000 houses and large areas of agricultural lands were flooded. Furthermore, two citizens died and hundreds were injured. In a related context, Hamas Movement held on Sunday a meeting with Palestinian factions in Gaza Strip to discuss the winter storm's effects. 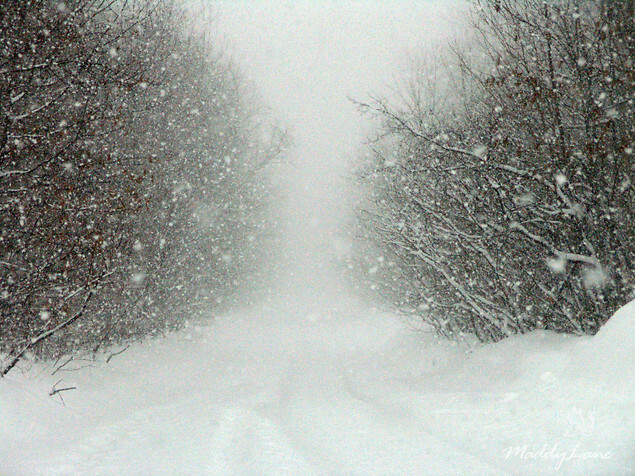 The spokesman for the movement Sami Abu Zahri said that this meeting came to evaluate the damages in the wake of the winter storm and the government's efforts to alleviate the people's suffering and to declare its future steps to compensate those affected by the storm. During the meeting, the Palestinian factions discussed ways to take part in the disaster relief operations, praising the government's efforts in handling the crisis. Israeli soldiers have violently attacked a young Palestinian man from Hebron, causing moderate injuries that required hospitalization. A man was also injured after being rammed by a military vehicle. Medical sources say that a number of Israeli soldiers violently assaulted resident Eyad Mohammad Hosniyya, from the Al-Arroub refugee camp in Hebron, as he was returning home. 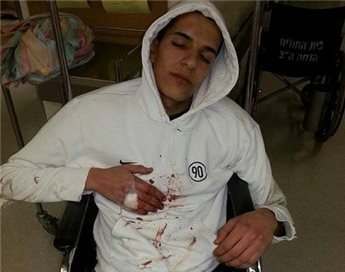 He was moved to the Beit Jala Governmental Hospital in Bethlehem, suffering moderate injuries. In related news, a Palestinian was moderately injured after being rammed by an Israeli military jeep, at the entrance of the Al-Arroub refugee camp, in Hebron. The resident, identified as Ma’en Hasan Obeyyat, 25, suffered fractures and bruises, and was moved to the Arab Society Hospital and Rehabilitation Center in Beit Jala. Hundreds of houses in central Gaza Strip were flooded as the Israeli occupation forces (IOF) on Saturday afternoon opened the earth dams east of the town of Wadi Salaqa in Deir al-Balah. The IOF established many earth dams east of the Gaza Strip to collect rainwater to use it; however in case the levels of water increase they open these dams and water flows to Gaza. Palestinian sources told Quds Press that the rescue teams and civil defense have evacuated 40 families including 200 people from the town of Wadi Salaqa and brought them to a shelter center. The sources added that 300 families have been moved to the shelter center of Hussein School run by the UN Relief and Works Agency for Palestine Refugees "UNRWA" in Jabalya north of the Gaza Strip. The Municipality of Gaza appealed to the residents living in low-lying areas in the Gaza Strip to evacuate their homes before the evening for fear their houses will be flooded with rainwater. Chairman of the Emergency Committee in the town of Rafah Osama Abu Nakira confirmed that two houses in Rafah, southern Gaza, were seriously damaged, pointing out that a specialized engineering committee was formed to evacuate the hazardous areas. He explained that the damages were caused by the heavy rainfall, and warned that many homes are threatened with collapse, especially in light of the poor infrastructure. Abu Nakira stressed that civil defense and emergency committees have not stopped working since last Wednesday, and appealed to citizens to cooperate with the Committees and evacuate the houses threatened with collapse. A Palestinian in the Gaza Strip has been shot dead by Israeli gunfire near the southern border fence, officials say. Reports say Israeli opened fire on the man late on Saturday when he approached a forbidden security zone east of Khan Yunis. The Palestinian subsequently succumbed to his injuries. Meanwhile, witnesses say that Israeli tanks were present at the scene when the incident took place. The Israeli military often targets Palestinians in the area. The incident came a week after Israeli troops killed 15-year-old Wajih Ramahi from the Jalazone refugee camp north of the city of Ramallah. The Tel Aviv regime has imposed a crippling blockade on the Gaza Strip since 2007, which has caused a decline in the standard of living, unprecedented levels of unemployment, and unrelenting poverty. This has literally cut off the populated strip, home to nearly 1.7 million people, from the outside world and turned it into the largest open air prison in the world. A Palestinian minor was shot and wounded when Israeli occupation forces (IOF) fired at him east of Beit Lahia, north of Gaza Strip, on Sunday morning. Dr. Ashraf Al-Qudra, the health ministry spokesman, said on his Facebook page that the 16-year-old boy was hit with a bullet in his left foot. He described the boy’s condition as moderate, adding that he was taken to Kamal Edwan hospital. 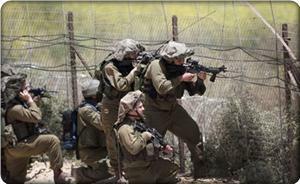 Israeli forces opened fire on a Palestinian teenager in the northern Gaza Strip on Saturday, injuring him moderately. The circumstances of the shooting were not immediately clear. Israeli troops have wounded a Palestinian man in the blockaded Gaza Strip, which is now hit by cold weather coupled with severe fuel and electricity shortage. Palestinian sources said the man was targeted on Saturday evening by Israeli tank fire east of the southern city of Khan Yunis. The Israeli army also confirmed the incident, claiming the Palestinian man was wounded by Israeli gunfire when he approached the Israeli separation fence. Palestinians in the Gaza Strip have been living under an Israeli blockade that has brought about a decline in the standards of living, unprecedented levels of unemployment, and unrelenting poverty in the region. The siege was tightened in 2007, one year after a democratically elected government led by the Islamic Hamas movement had to limit its rule to the coastal enclave following a coup attempt by the rival Fatah party. This has literally cut off the populated strip, home to nearly 1.7 million people, from the outside world and turned it into the largest open prison in the world. On Saturday, officials said that some 40,000 Gazans were displaced due to torrential rains that started earlier in the week, while some parts of the region was covered with snow. The cold snap comes at a time when the majority of Gazans have been experiencing fuel shortages and power cuts after the territory's only power plant was shut down due to a fuel shortage last month. The plant remains out of service due to fuel shortage while the facility's old pumps cannot be repaired because of a lack of spare parts. 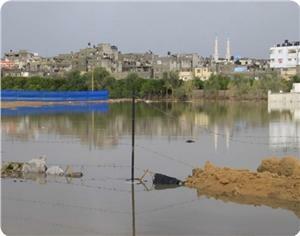 Israeli occupation authorities opened up dams to the east of Gaza city on late Friday. 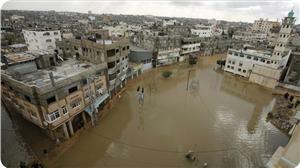 Eyewitnesses said many residential areas and farming land east of Gaza city were flooded when the Israeli authorities opened up the dams. The residents of the area appealed to the concerned authorities to intervene before sewage water completely submerge their properties. Earlier on Friday, Chairman of Government's Disaster Response Committee Yasser Shanti said the Israeli authorities opened up dams just to the east of the border with the Gaza Strip earlier in the day. He warned that the residential areas within the Gaza Valley would be flooding within hours, saying the move would flood areas in Moghraqa and other parts of Deir el-Balah in central Gaza. 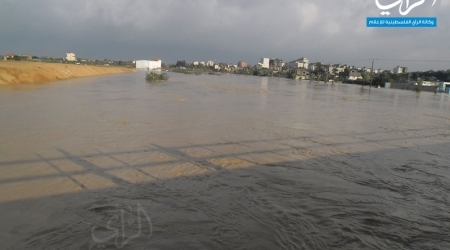 Shanti called upon residents of areas near the Gaza Valley to evacuate their homes in preparation for the anticipated flooding. The Gaza Strip has been under a severe economic blockade imposed by the Israeli occupation since 2006. Despite the extreme snowstorm hitting different parts of occupied Palestine, dozens of Israeli soldiers invaded the Shweika village, near the northern West Bank city of Tulkarem, broke into a home and violently searched the premises. The Palestine News Network (PNN) has reported that the soldiers invaded the village at approximately 1:30 AM, and raided the home of Yahia Mahdawy. PNN said that the soldiers conducted violent searches in the home, causing anxiety attacks amongst family members, especially the children, as the soldiers were shouting and pointing their guns at them before forcing them into a room, as they searched the rest of the property for several hours. Mahdawi told PNN that the soldiers left his home at approximately 5:30 AM, leaving excessive damages to furniture and family belongings. He added that the soldiers did not even allow the family to ask them about the cause of the raid, or what they were searching for. The invasion is part of repeated Israeli violations targeting the Palestinians in different parts of occupied Palestine. Such invasions frequently end with several arrests and excessive property damage to dozens of homes and cars. 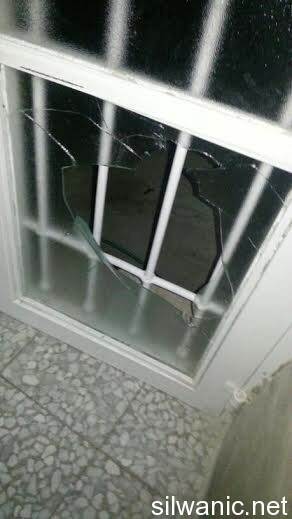 Israeli soldiers frequently detonate the doors of the invaded homes, instead of knocking or simply breaking the doors. The Israeli Occupation Authorities (IOA) have opened the floodgates of one of its dams in the eastern part of the Gaza Strip, flooding dozens of Palestinian houses in Deir al-Balah and al-Mashaalh eastern Gaza Strip. Wadi al-Saka village's mayor confirmed that Israeli authorities opened the dam’s floodgates without any prior warning, flooding more than 20 houses. 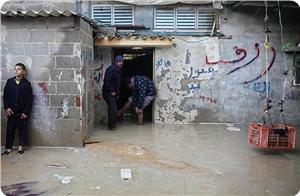 The houses of many Palestinians have been flooded and a number of people are trapped inside, while rescue teams tried to evacuate the trapped people. The waters from the dam flooded houses in Deir al-Balah, while municipal crews started using sand berms to reduce water flows. Israeli forces exchanged gunfire on the Lebanese-Israeli border on Thursday after shots were fired from the Lebanese side, Israel's army said. "Fire was opened near the Lebanese-Israeli border in the northern Galilee. Israeli soldiers responded with fire to the source of the shooting," an Israeli army spokeswoman said. The source of the gunfire was most likely Lebanese poachers, the spokeswoman added. On Saturday, a bomb was detonated along the border in the Golan Heights as patrolling Israeli troops passed by. No casualties were reported from the explosion, which Israeli media said occurred on the Syrian-held side of the fence separating it from the Israeli-occupied zone. Israel seized 460 square miles of the strategic plateau during the 1967 Six Day War and annexed it in 1981 in a move not recognized internationally. Syria has always insisted on its return as part of any peace treaty with Israel. Feeling somehow cornered by peace efforts led by US Secretary of State John Kerry, Israel has been stepping up the "policy of provocation" vis-à-vis the Palestinians. Israel hopes, pundits believe, that "rash acts or actions" by the Palestinians would help extricate the Jewish state from its current political predicament or at least enable the Israeli government to blame the Palestinian Authority (PA) for the deadlock in the political process. Acrimonious arguments have been going on within the Israeli government over current peace efforts and the perceived notion that the Obama administration is convinced that the Jewish state is not being sincere enough about pursuing peace. According to the Israeli media, an American offer to use advanced American technology to monitor West Bank's borders with Jordan has effectively annulled the plausibility of Israeli demands for keeping Israeli troops stationed along the Jordan River, which the Palestinians reject very strongly. Israel has flatly refused the American offer, which Palestinians say is casting real doubts on Israeli intentions and willingness to end its occupation. Earlier this week, the Israeli government allowed hundreds of religious Jewish fanatics to celebrate a Jewish religious holiday by roaming the Aqsa Mosque courts. The fanatics, escorted by heavily armed soldiers and other security personnel, carried with them Jewish religious objects, including a Menora or lamp-stand. Palestinian worshipers and students were assaulted and forcibly removed in order to leave the Jewish intruders undisturbed. It is widely believed the audacious feat underscored the determination of Jewish millenarians to pursue efforts to destroy, demolish the Aqsa Mosque or at least seize the Islamic sanctuary of 144 years, in full or in part, from Muslims. "These people are hell-bent on triggering a worldwide bloodbath. They are fully backed by the Israeli political-security establishment" said Sheikh Muhammed Hussein, head of the Supreme Muslim Council, catering for the holy place. "For us Muslims, seeing Jews usurp our Mosque, which symbolizes the existence of Islam and Muslims in Palestine, is unthinkable. I am not going to indulge in rhetoric but I want to tell you that no provocation would be greater or graver than seeing these Zionist fanatics embark on doing what they say they are going to do." Israel understands well the ostensible veracity of the Sheikh's words, especially his allusion to the immense bloodshed and violence Jewish provocations at the Aqsa Mosque could trigger. Hence, it is quite possible that the Netanyahu government, in coordination with religious Zionist groups, would view upping the ante at the Aqsa Mosque, known to Jews as Temple Mount, as Israel's ultimate savior and rescuer from an irksome and highly undesirable peace process that could strip Israel of its lebensraum. Israeli provocations were by no means confined to the Aqsa Mosque. This week, the Israeli army shot and killed a Palestinian child at the Jalazon refugee camp near Ramallah. According to eyewitnesses, 14-year-old Wajih al Ramahi was murdered in cold blood by an Israeli army sniper. "He didn't pose the slightest threat to Israeli soldiers, it seems the soldiers didn't want to leave the camp without spilling blood," said al-Ramahi cousin Muhammed. "These people (Israeli troops) are worse than the Nazis." A spokesman for the Israeli army refused to comment on the incident. The PA said it held Israel "fully responsible" for the crime. The killing near Ramallah coincided with an escalation in Jewish terrorist vandalism against Palestinians and their property and religious places on both sides of the Green Line, the former armistice line between Jordan and Israel. On Sunday, 8 December, Jewish terrorists affiliated with the anti-Palestinian gang known as "Kach" scrawled anti-Islam graffiti at the wall of the main mosque of the Israeli-Arab town of Baqa al Gharbiya. The perpetrators also vandalized property and punctured car tires. Such attacks have come to form a real phenomenon as the Israeli intelligence and security apparatus have so far failed to apprehend, let alone, prosecute, the perpetrators. 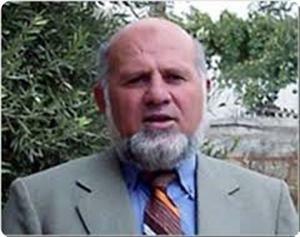 This prompted Israeli as well as Palestinian commentators to accuse "certain elements" within the Israeli government and the Shin Beth (Israel's main domestic security agency) of conniving and colluding with the terrorists by enabling them to carry out their criminal acts and escape with impunity. Earlier this month, PA officials intimated to U.S. officials that the current status quo in the West Bank was untenable and that the PA security agency might eventually be unable to prevent the occurrence of a popular uprising against both Israel and the Ramallah regime. What is amply clear though is that the Israeli government views the possible outbreak of a Palestinian uprising as an opportunity to reach a kind of "get riddance" that would free Israel, at least temporarily, from incessant international, especially American, demands to get serious with regard to the peace process. At 2:30am Wednesday, Israeli occupation forces raided the Aida refugee camp in the West Bank city of Bethlehem, searched through a number of houses and went through the contents of the homes. The leaflets warned that the Israeli army will not accept this situation and that its troops will work strictly to suppress and prevent such acts. The leaflets called on the camp’s residents to stop these acts in order to ensure the security and safety of the residents in the area. It was also added that if such acts continued, the residents would be subjected to “stricter security practice,” as it was defined by the IOF. Local sources in the camp said that Israeli forces raided the camp at dawn, broke into several houses and arrested a number of youths. IOF soldiers arrested the brothers Khalil, 21, and Mustafa Abu Akr, 24, Hamdi Ali Ayad, Mohammed Adel Jadou, Jawwad Mohammed, 20, and Khader Akram Abu Khudair, 18. The sources added that Israeli forces handed the two youths Ahmed Amer Odeh, 24, and Saed Khalil Abu Akr, 21, notices to meet with the Israeli intelligence forces at Gush Eztion settlement complex, south of Bethlehem.